During the Paleogene, extensive erosion of upland areas occurred in northern New Jersey as southeastward-flowing streams carried large quantities of sediment to coastal areas. Sea level fluctuations continued to influence the sedimentation and environmental habitats in the coastal plain of southern New Jersey. Early Paleogene deposits are rich in bryozoans, corals, and echinoids, typical of warm, shallow waters. Fossil shells of brachiopods are found in Ocean and Burlington Counties, while shark teeth are a common find in Shark River Park in Monmouth County. Bone fragments and teeth of both marine and terrestrial mammals have also been found, but are less common. Fossil traces of burrowing shrimp are well preserved in southern New Jersey, while microfossils, such as foraminifera and diatoms, are widespread and often used to determine the age of Tertiary marine deposits. This map indicates that the primary exposures of Paleogene rocks are in central New Jersey and south. Paleogene Fossils of New Jersey can be broken down into the following phyllums. See Paleogene Invertebrate New Jesrsey Species for summary list of species. 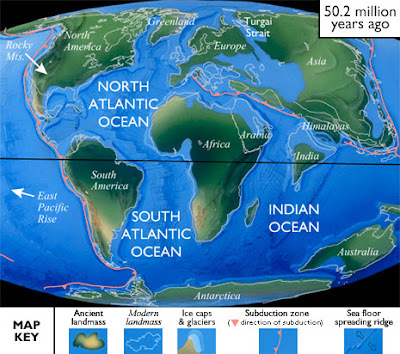 North American Paleogeography: As sea level dropped, the inland sea that covered much of North America during the Cretaceous withdrew. Grasslands, large lakes, and small mountain ranges covered the central and western states until tectonic changes occurred on the western margin. Rapid uplift in the west created the modern North American Cordilleran in the U.S., Canada, and Mexico, eroded much of the ancestral Sierra Nevada, and generated volcanism that helped form its modern equivalent. Fossils indicate a warm-temperate to subtropical climate in the Early Tertiary of North America. Later in the period, the climate cooled significantly, and many of the warm-weather organisms disappeared from the fossil record in North America. This pattern was repeated with another warming trend followed by a much colder climate in the Late Tertiary.